Take command of your culinary skills. Ready for dinner? Serve it up right with these Swedish Military Surplus XL Ladles. Constructed from durable stainless steel, with a built-in spout and extra-long gooseneck handle for easy pouring. Ideal for serving soup, stew, homemade beverages and more. 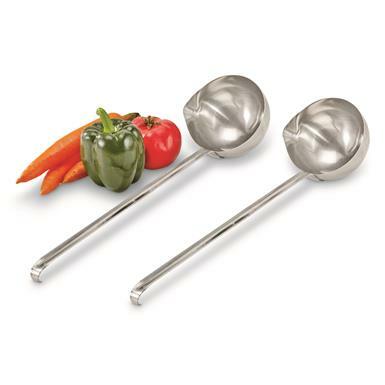 Includes two Ladles for one low price!